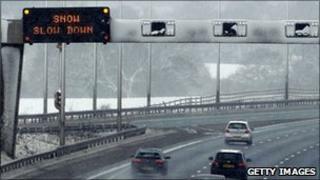 Drivers have been warned that conditions may be "treacherous" as sub-zero temperatures continue. Insp Darren Webster, from Warwickshire Police, said minor inclines may have become dangerous icy slopes after cars had driven over compacted snow. He said traffic was moving on the M40, M42 and M6, but was generally slow. Meanwhile, train and bus services were facing some disruption, but the situation was better than on Saturday. London Midland said it planned to run a full Sunday timetable. Virgin Train services were running but people were warned to expect delays. And Chiltern Railways said it would be running an emergency timetable because of the conditions. Stagecoach said its buses would largely only operate on main roads in Stratford-upon-Avon and Leamington Spa as a result of the snow. Temperatures in the region were set to range between -1C and -15C on Sunday. And the Met Office renewed its warning of severe weather across the West Midlands region. It said there was a continued risk of widespread ice on untreated roads and pavements during Sunday and Monday. West Midlands Ambulance Service said roads in the region were "littered with abandoned vehicles following the significant snowfall". The service urged residents to make sure elderly, frail and other vulnerable people had essential supplies and did not have to go out in icy conditions and risk hurting themselves. Some flights at Birmingham Airport have been cancelled or delayed because of snowy conditions. Travellers were urged to check the airport's website and with their flight operators for details.